Merci Fabrice. Yes, it's very beautiful on whole Ramblas street, espeically at later afternoon, many moving snacks shop, yum yum. and inside market, there are many many fresh fruits. very cool place. Thank you Sara, I really love Barcelona, so beautiful. I like how busy the photo is, and how you toned down the colors a little bit.. Great shot..
awesome mood and compoistion of colors! Congrats on a very well deserved award, this image ha so much going on. Thank you Nigel.so many tropic fruits, it's amazing city. Thanks stingRay. when i came back and was looking at my photos, this one is interesting, very colorful. CONGRATULATIONS Helen for the award and this wonderful colourful composition which is filled with great detailing of all those beautiful fruits and vegetables. An amazing array of natural food. Well done, best wishes. aha, i see, thanks for encourage. 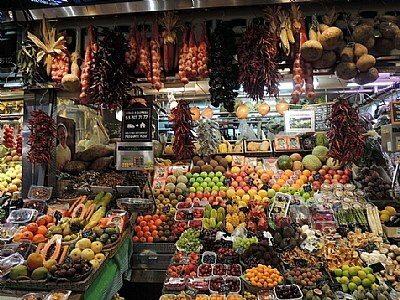 I love Barcelona market, there are so many colorful fruits;) hmmm, started miss it. Thanks:) you also shot wonderful photos too. so colourful, delicious and healthy.. ;) Thanks for your kind comment on my picture.